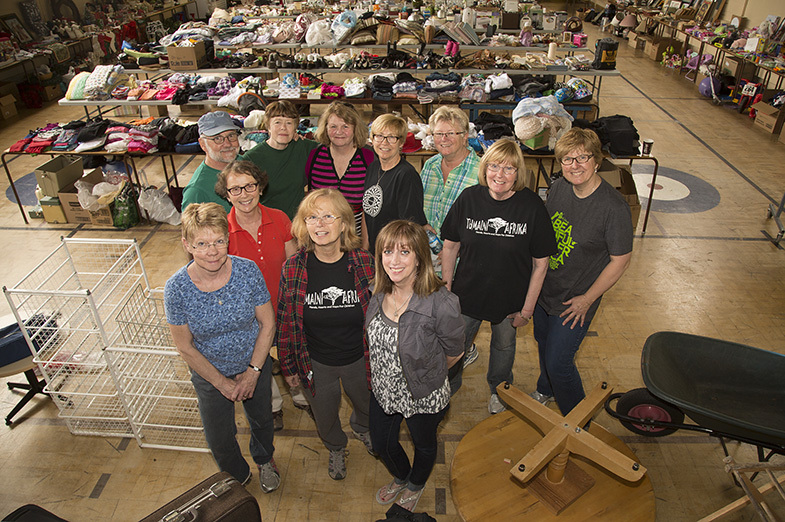 Nine months after holding an indoor garage sale in support of a school in Africa, retired principal Holly Wickett is proud of the change she and her group have accomplished with the project as they prepare for another sale. One letter in particular that Wickett received from an aid worker who visited the Compass School outside Nairobi touched everyone in the Sault Ste. Marie-based group. “Not only have the funds been great, you have brought hope to the school,” it read. That was all the more poignant for the group, who now call themselves Tumaini Afrika. Wicket said ‘tumaini’ is the Swahili word for hope. Last September’s sale raised $5000 for the group, which was put in use in part by purchasing a generator for the school. “It is now the rainy season and they can see in their classrooms for the first time,” Wickett said. Wicket said the group was astounded by the generosity of people who supported the last sale. “I remember last year someone bought a jigsaw puzzle and gave us $50 because they knew the cause it was going to. We were astounded,” she said. She spent three weeks in March of 2014 participating in what she called “voluntourism," where people pay to travel to another country and do volunteer work while there. The group Wickett toured with visited schools, orphanages and women’s shelters across Kenya, Uganda and the Democratic Republic of the Congo and was also able to participate in rafting the Nile River and going on a safari during her three-week stay. This allowed the group to make contacts with people who are able to check on the school and ensure the money and items sent are being used effectively. “It’s important that you know somebody, so you know the funds are being used for the right things,” said Wickett. The Compass School stood out for Wickett, as it is intended to teach orphans and refugees. Wicket said the idea is to help the students in Kenya to help themselves, the group purchased chickens which now provide eggs for the school to sell and the group has hired sewing teachers to instruct the students. “We think that’s going to help the school and help the kids when they leave the school,” she said. The group is careful to ask the Compass School for what items it needs, not to assume and end up sending items which are not needed. Tumaini Afrika has partnered with Northern Heights Public School, whose students exchange letters and photographs with children from the Compass School. The Northern Heights students raised enough money to start a breakfast program at the Compass School and to repair a hole in the ceiling. “It was bad, we wouldn’t have been able to go there if it was in Canada,” said Wickett. In addition, students from Korah Collegiate and Vocational School raised $1,500 at Christmas for the Compass School. The group also sells crafts on occasion at the community table at Mill Market and Grand Gardens donates its empty bottles to Tumaini Africa. “We have raised more than $1,000 with their empties. They have been wonderful,” Wickett said. Members of the group plan to travel to the area next March, where they will get to see first-hand the difference in the school from the last time it was visited. Another garage and bake sale is scheduled for this Saturday at St. Andrew’s United Church Auditorium from 9 a.m. to 2 p.m. Donated items can be dropped off at the church today or tomorrow from 9 a.m. - 5 p.m.
Kenneth Armstrong is a news reporter and photojournalist who regularly covers municipal government, business and politics and photographs events, sports and features.